Recognized by the Irvine city council for sponsoring the 2018 Irvine global village festival. Poi finalists! Stephanie: 1st place national champion; christina: 3rd place; ashley: 4th place; allison: 5th place; kevin: 6th place. Congratulations to Stephenie! In her first national tournament performing a POI she won 4th place! Stephanie - a middle school student competed in the hardest interpretive (acting) event, against the top high school seniors in the US, at one of the most prestigious events in the world.Thank you coaches for your great work. Thank you Stephanie for being willing to take a chance on something new! We took 3 girls Lauren P., Allison L., and Stephanie H., to their first debate tournament. But this wasn’t just any local competition. Several of the schools are ranked in the top 10 in the US or World. And the judges were the best in the world. At Harvard Westlake, one of the top debate competitions in the US, our shy kids took 9th and 10th place speaker awards and 5th place overall. We only lost one round, to Polytechnic, a top 5 K-12 school in the US. And of course, we train Poly students too. congratulations to our student Brandon Pae at Pacific Academy who competed at the the Ronald Reagan Presidential foundation Great Communicator Debate series. In his first attempt at a new style of Debate, he competed at a national level tournament, was a finalist, and qualified for a $3000 scholarship and a study in Washington DC program! (Feb. 2018) Top Speakers once again! Congratulations to our teams from Polytechnic and Northwood high schools! At their first time competing at the regional championships of the High School Ethics Bowl at Chapman University, they were top teams at the event. Polytechnic was undefeated in their preliminary rounds. They won 1st place for best commentary (top speakers) and 3rd place overall. Northwood had a nearly perfect record, losing only one preliminary round. This is a truly amazing result because our teams were younger than every other team. Most teams were in the 12th grade. Our Polytechnic team is a team of sophomores. And our Northwood team was the only freshman team at the Ethics Bowl. They were also the smallest team, with only three students. Most other teams were 7 people. We love to encourage our students to challenge themselves. The Ethics Bowl requires students to be able to think deeply about moral problems and to work together to find a solution. The judges are Philosophy professors at Universities. So, every student has to take care to be precise and to explain themselves at a college level of analysis. We have A very comprehensive communication education system. 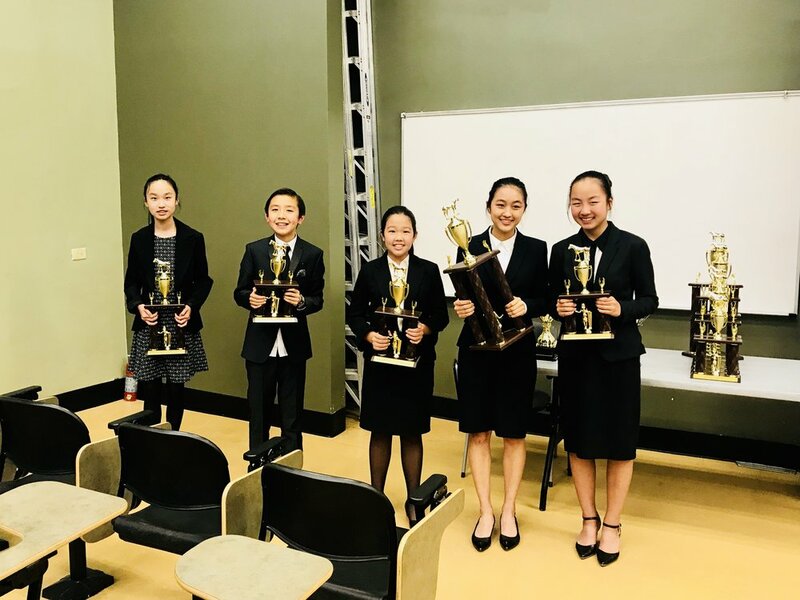 At every tournament our students have won in limited preparation events, acting, researched based speeches, and debate. More than 90% of our first year students win awards. And we are happy to announce that our ESL students won in both the ESL category and against native English speakers. Our students took 1st place overall in middle school and 3rd overall in elementary. We had students win in every category of speech: limited preparation, platform, interpretation of literature (acting), and debate. So proud of all of you! Congratulations students for your amazing performance at NCACF! Taught speech and debate to famous Chinese movie star Wei MinZhi from the award-winning director Zhang Yimou's movie Not One Less. We are the winning team! 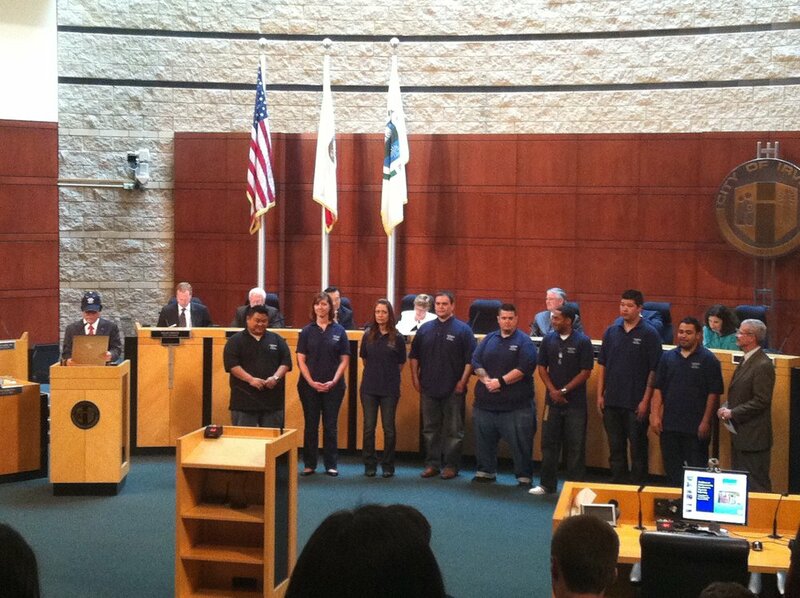 Receiving an award from the Irvine City Council. The founder of ModernBrain actively works with tournaments to design new event to improve the speech and debate community. Giving speech at tournament about the new event and giving award.